The Diocese of Buffalo was established in 1847 with John Timon as the first Bishop. Patrick Keeley, a student of A.W.N. Pugin, was chosen as architect for the cathedral church of the Diocese. Work was begun in 1851 and completed in 1855. The three large windows in the sanctuary depicting the Nativity, the Crucifixion and the Resurrection, are of particular interest. The story is told that Bishop Timon, on a trip to Europe, happened to view these windows. They had been made in Munich by Joseph Gabriel Mayer, had won first prize at the Munich Exposition of 1850, and were in the possession of former King Ludwig of Bavaria. 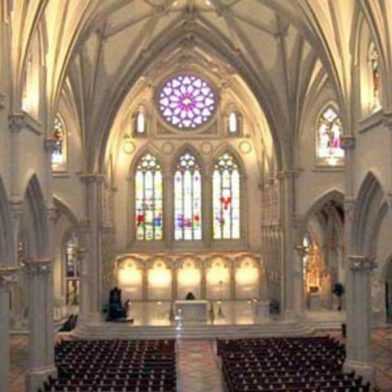 Bishop Timon asked Ludwig if he would consider giving the windows for the new cathedral in Buffalo. Ludwig at first refused, but Bishop Timon persisted and today these three windows grace the sanctuary.